Hello... Hello ... my old friends ... It's great to see you once again! This was a fusion, a coming together of two  of my musical heroes before I was even aware of them. 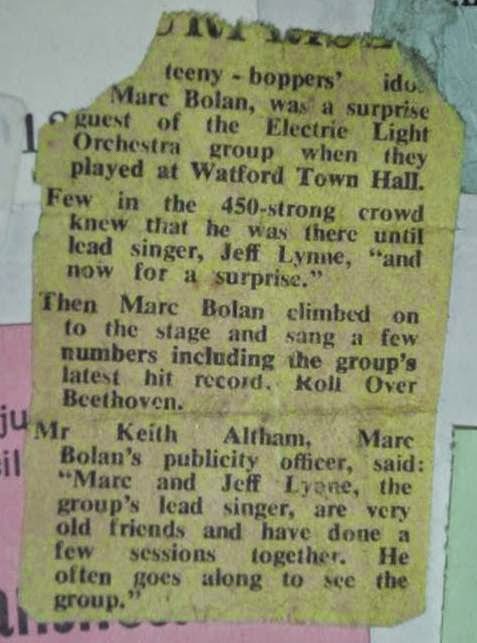 I've been fascinated by the proceedings at Watford Town Hall on the night of Tuesday 10th April 1973 when the early Jeff Lynne captained Electric Light Orchestra [ELO] were joined on stage for a pulsating and explosive fifteen  minute encore of their latest hit single "Roll Over Beethoven" by the one and only Marc Bolan, who was still riding his proverbial white swan and enjoying significant popularity and success. Marc's friendship with Jeff Lynne began when The Idle Race performed their revved up cover of "Deborah". Marc was so impressed by their powerful live interpretation of his song that it led to him changing direction to perform electric sets [rather than acoustic]. Marc was a regular onlooker at Idle Race recording sessions thereafter. 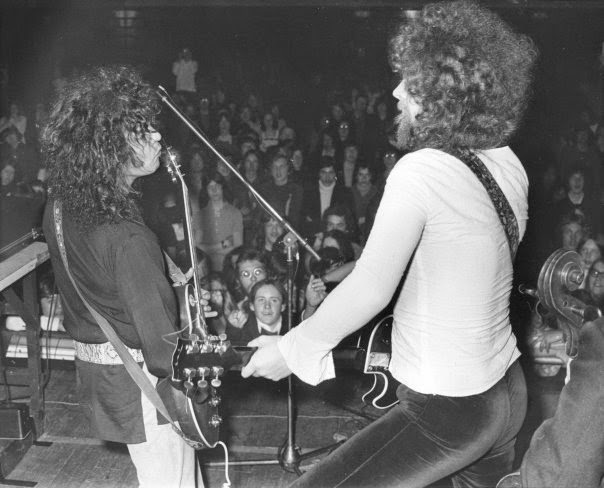 Shortly before the Watford gig, Marc was recording with T.Rex at Air Studios whilst Jeff was recording "On The Third Day" with ELO, contributing twin and/or lead guitar parts to "Ma Ma Ma Belle", "Dreaming Of 4000" and "Everyone's Born To Die". The 1963 Gibson Firebird that Marc lent to Jeff can also be heard during that familiar guitar solo on "Showdown". This article has been a long time in the making. I wanted to pull together the strands of the memories of some of the musicians and attendees at that concert whilst gathering some of the photographic footage of the event [predominantly by Gary Merrin] plus some exclusive new images of memorabilia from that night. Hence, please find below the recollections of ELO's Jeff Lynne and Bev Bevan [plus Mike de Alburquerque] as well as eyewitness accounts from the perspective of concert goers Ian Jakeman and Bari Watts. 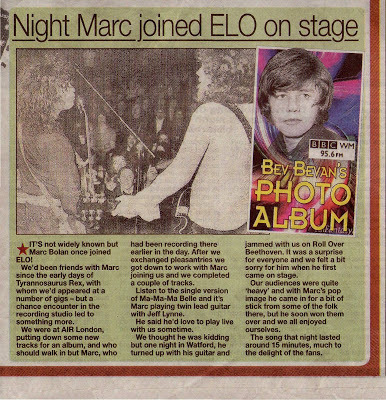 Jeff Lynne [ELO]: "Marc Bolan is a friend of mine from a few years back. He was in Air [Studios] - dubbing something - and we had a good booze up, a bit of a reunion. It was the first time I'd seen Marc for about two years, and he asked if we were doing any local gigs. Then he came along to Watford and joined us on "Roll Over Beethoven", which was the last number. Right from the beginning, the girls at the front spotted him at the side of the stage and they were screaming all through the set ... It was an experience for us just to see it really happening, but he must get choked off by the fact that he can't hear himself play because he really is a good guitar player you know!" Bev Bevan [ELO]: "It's not widely known but Marc Bolan once joined ELO! 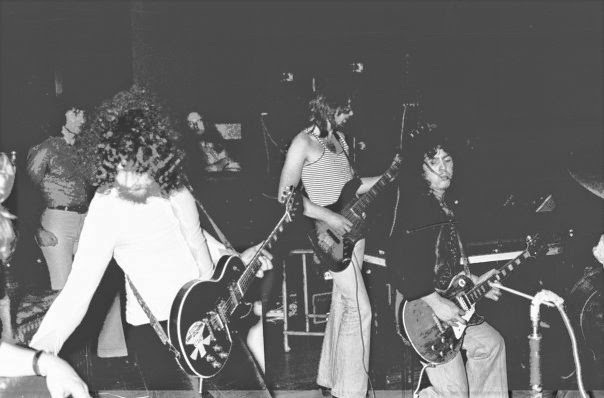 We'd been friends with Marc since the early days of Tyrannosaurus Rex, with whom we'd appeared at a number of gigs - but a chance encounter in the recording studio led to something more. We were at Air [Studios] London, putting down some new tracks for an album ["On The Third Day"], and who should walk in but Marc, who had been recording there earlier in the day. After we exchanged pleasantries we got down to work with Marc joining us and we completed a couple of tracks. Listen to the single version of "Ma Ma Ma Belle" and it's Marc playing twin lead guitar with Jeff Lynne. We thought he was kidding but one night in Watford, he turned up with his guitar and jammed with us on "Roll Over Beethoven". It was surprise for everyone and we felt a bit sorry for him when he first came on stage. Our audiences were quite 'heavy' and with Marc's pop image he came in for a bit of stick from some of the folk there, but he soon won them over and we all enjoyed ourselves. The song that night lasted around 15 minutes, much to the delight of the fans!" Ian Jakeman [Marc Bolan/ELO fan]: "My memories of the gig are somewhat unclear and somewhat faded! 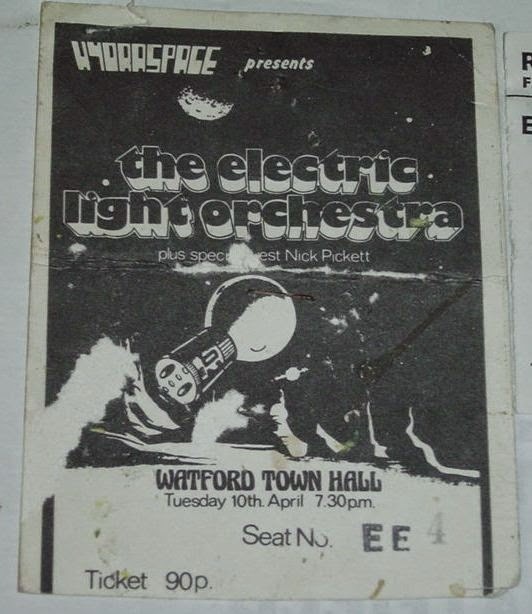 I was 12 years of age and it was my first ever gig - Watford Town Hall - The Electric Light Orchestra with support from Nick Pickett, a folk guitarist, I think. I went on my own as it was just ten minutes from my home. I remember that I bought my ticket from Harum Records in Watford - and a great shop it was too! My parents must have been concerned about me going alone but I don’t recall them questioning me about going. I’d already made my mind up to go! Hearing "10538 Overture" had made me want to go in the first place. I remember that the venue was not full and also how loud it seemed but it was, after all, my first ever gig so that would have been the case I guess. I also remember loving the night! 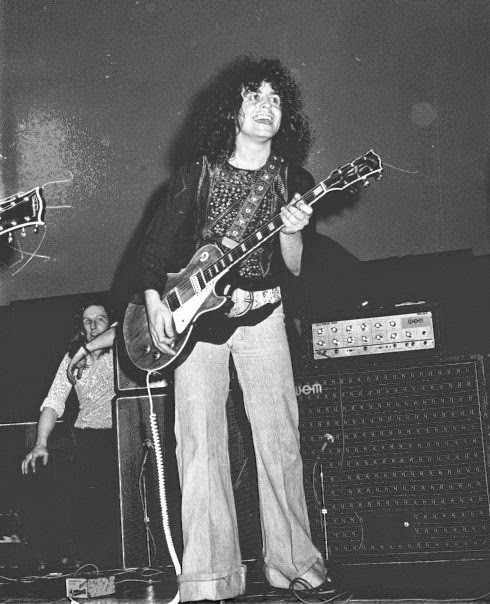 T.Rex were my favourite band at the time so when Marc Bolan came on stage, from the right side of the stage if I recall correctly, to perform with ELO for the encore for what must have been ages to do "Roll Over Beethoven", it was a real treat! I think that it was the current single at the time. I went home that night thinking that all gigs would be like that and I was hooked forever. Well done ELO! This is currently my 39th year of working in the music business having begun in 1975 as a Saturday boy in the WH Smith record department! My next gig, at the age of 13, would be Uriah Heep at Wembley Empire Pool with Alan Freeman as guest. I began my life of going to gigs with one hell of a gig!" 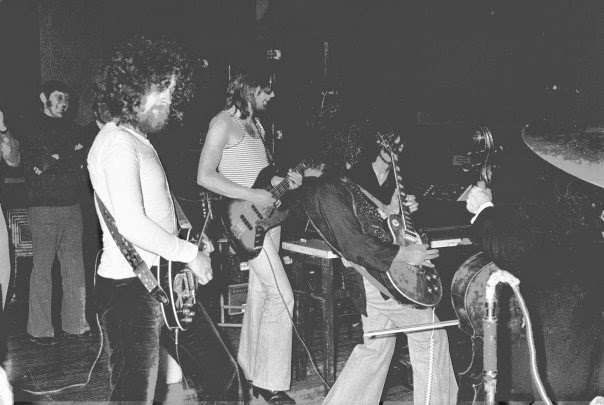 Bari Watts [Marc Bolan fan]: "If I had seen the advert for this gig, to be honest, I probably would not have gone as I was not an ELO fan in those days at all really. A mate and I went to gigs in and out of London together a lot and sometimes it would be a gig we both fancied and other times we would just tag along to each others choices. He said to me, "Fancy going to the Town Hall tonight? ", so I asked who was playing. When he told me it was ELO, my face dropped, but as I said, he often came to gigs of my choice and, as Watford Town Hall was very close to where we both lived and we used to go there a lot anyway, I reluctantly agreed. So after sitting through the entire ELO set - feigning interest - the set finally ended [I can't remember if there was a support act]. Then, Jeff introduced a very special guest and on swaggered Marc Bolan! For the first time in the entire evening I woke up! I had been into Marc's music from early 1968 [I still am] and the last time I had seen him play live was I think at The Lyceum in late '71, just when his pop stardom really started to happen - so let's just say I was a tad happy! They launched into a rock 'n' roll medley which to my memory included "Roll Over Beethoven" and, although it went on for some time, for me it was not nearly long enough! Marc was really into it and did his whole rock 'n' roller routine and it was just marvellous. I've heard there was apparently some dissension from a section of ELO fans, but to be honest from memory, I didn't witness it myself. Everyone seemed to be really into it and enjoying themselves, almost as much as Marc was! This was sadly the last time I ever saw Marc play. I was and still am heavily into the Tyrannosaurus Rex and early T.Rex era of Marc's music and I think when he became a very big star, I kind of felt that it had all moved on to a new younger generation. I think we all experience things like that. Something what you naively think is 'yours' suddenly becomes 'public property' - but on this occasion it was great to see him strutting his stuff again! Anyway, years later in 1985, as a sound engineer I was working on the soundtrack recordings for a stage musical. On one of the sessions I had ELO bass player Mike De Albuquerque in laying some stuff down on the show tracks [one that I actually played guitar on]. During the course of the sessions, we spoke about the Watford gig briefly and Mike said that he personally wasn't 100 per cent aware that Marc was going to appear, although Marc had been in the studio with the band on earlier dates and it was a possibility. He did say that he really enjoyed Bolan's presence there that night though. I wish I could remember a bit more of this gig, but it was a long time ago! Cheers!" With the 37th anniversary of the death of Marc Bolan fast approaching on 16th September, it remains ironic, if not fated, that Marc died in the very year that ELO were reaching the same heady levels of success with: "Out Of The Blue" that Bolan had achieved in the early seventies when ELO were largely unknown in the UK and Marc was [and still is] the ultimate, iconic Superstar. Keith great article well written and well researched.Marc I credit with my love of music as Hot Love in `71 was the first single I brought whilst I say ELO got me through college.So much great info on here thank you,keep up the great work. Very cool article & great job KJS! Wish I would have seen that one! Nice article...but I would just check those dates..twas 73...not 74 as stated! I was there too. Aged 15. Poor comparison to Lindisfarne and Genesis at the Top Rank, but a good night as far as I can remember! Hi all. I was the town halls electrian who carried out the evening events at the hall. Hi Keith. I was just surfing the net when I thought about the night. We had the card with the smiley face valued at Philips in new bond street where I also worked as an electrician. They said it was the face that made it worth £500 or more. Love this thread. Photos I hadn't seen before too! 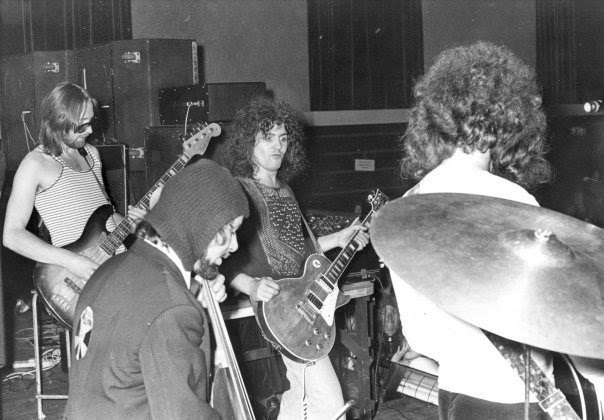 I have some friends who saw T.Rex play Stockton ABC in 1971. They waited around back stage door and met Marc who signed autographs and chatted. Nobody had a camera though, so that is one photo opportunity missed!